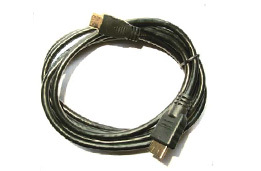 Quality HDMI to Mini HDMI cabling for your devices. MAre you looking for a low cost but high quality HDMI cable solution for your Tablet computer, Smartphone, Notebook or any other audio/visual device using the standard HDMI Mini connector? The new C-HDMI-MINI from LMS Data is a highly cost-effective solution for users wishing to output true 1080p quality video and high resolution sound to existing HDMI TVs, monitors and projectors. Ideal for connecting your device directly, courtesy of its generous 1.8 metre cable length. And just because price is highly competitive, quality construction throughout ensures good signal quality, exceeding many more expensive vendors' offerings. Robust connectors with gold plated HDMI and Mini HDMI connectors ensure both excellent signal conductance plus reduced corrosion properties over time. So, if you're looking for a low cost but quality HDMI to Mini HDMI cable for your digital devices, look no further than the new C-HDMI-MINI for your Hi-Def audio/visual applications!